One of my favorite aspects of traveling is trying out new foods and restaurants in the area that I'm visiting. This has become slightly more complicated for me being gluten-free, having restrictions with certain nightshades and trying to avoid foods in general that could possibly cause a flare with my colitis, something I definitely want to avoid while traveling! 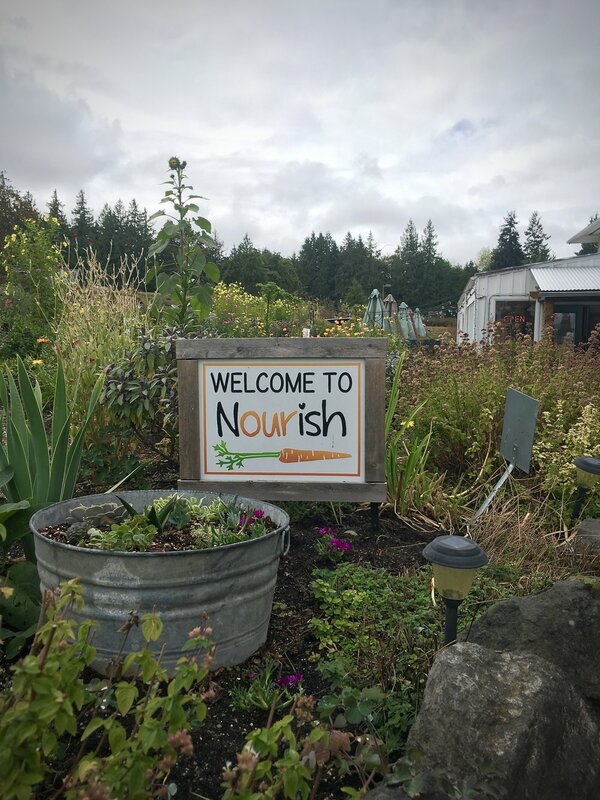 I had done some research on Paleo and gluten-free eating around Seattle so I had a small list of options but many of these places we actually found last minute, depending on the area we were in that day. I always make sure to read menus beforehand so I know that I'll have at least a few options to choose from and if I can, I try to find a couple Yelp or TripAdvisor reviews about how well they handle gluten-free requests. Everywhere we went was incredible and I was super impressed with the menus and accommodations for those who need to eat gluten-free. I never once felt limited in my choices (a common misconception with food restrictions!). I also feel like establishments have begun to recognize the demand for more gluten-free choices and are becoming more and more accommodating. Most pizza places now you can even order a gluten-free crust, that's saying something! I'd like to note that I don't normally eat a lot of "gluten-free" products (gluten-free breads, buns, pasta, etc.) but dining out tends to be the exception. I know that now (after doing lots of gut healing) I can tolerate these products and it makes dining out even more special as I get to enjoy "treats" I don't normally consume on a day to day basis. Keep this in mind as you read about my dining experiences and as you plan your own travel adventures! Fresh off the plane and stopping at our AirBNB only to unload our luggage, we immediately set our sights on finding non-airport food. I had done a pretty extensive amount of research on dining out Paleo/gluten-free in Seattle and Local 360 was always a top recommendation. When we realized it was a very simple drive from where we were staying, it was a done deal. I was immediately drawn to not only their menu but to their philosophy. I’ve said it before but I’ll say it again, fresh local ingredients make ALL the difference in how flavorful the food is. Local 360 did not disappoint. For starters, I had little gem lettuces with a tarragon vinaigrette and for my entree a NY strip steak (medium rare, get outta here if you order it well done😝) with a side of hand cut fries. My dad literally ordered the same thing as me, we’ve always had similar food choices and LOVE dining out. If no one were there to stop us (aka my mom) we’d rack up the greatest bill for a 2 top 😂 Corey and my mom went a different direction and tried Local 360's three course seasonal tasting menu, which that night included chèvre stuffed squash blossoms, a seafood stew and homemade creme brûlée. All of our food was incredible and so satisfying after a whole day of traveling! If you follow a Paleo template, you won't want to miss this spot while you're in Seattle! 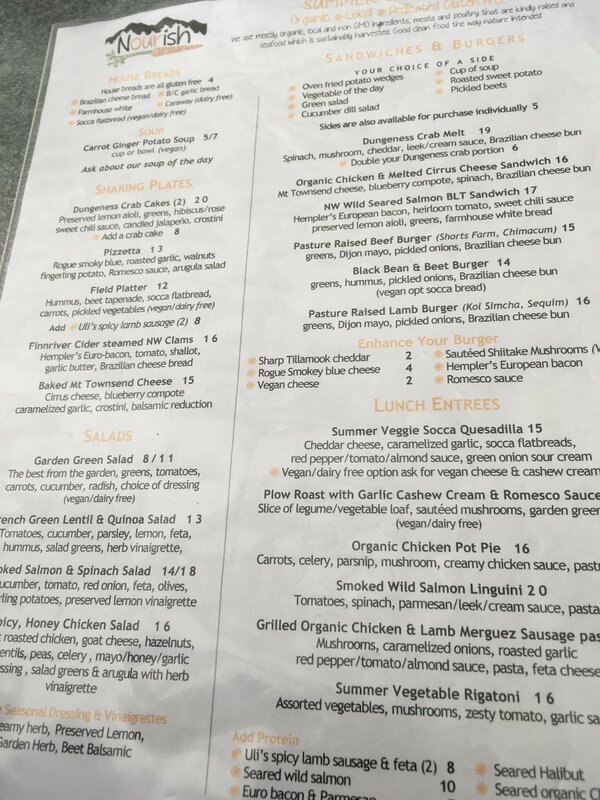 This was our second dinner in Seattle, scouted out by my mom who had done some searching on Yelp and read that they offered an entire gluten-free menu, which I was beyond psyched about. I was doubly excited when we got their and I realized that it wasn’t just a few items that could be made gluten free by leaving off the bun or subbing vegetables instead but they actually had many unique menu items that were specifically made gluten free such as the wild Alaskan salmon with gluten free pasta, which I ordered. Normally I’d be totally fine with meat/seafood and vegetables but sometimes you just wanna live a little and not feel like you have to miss out on comfort foods because of your dietary restrictions! The gluten free pasta dish was so yummy. The pasta was cooked perfectly and came in an amazing basil garlic cream sauce with caramelized onions and salmon on top. I’m drooling just thinking about it. They also offer gluten free burger buns, corn tortillas and all of their chowders are gluten free! My mom had their fish tacos, Corey a grass-fed burger and my dad their Dungeness crab cakes. Dukes only sources sustainable seafood and wild salmon (never farm raised) which makes them awesome and a great choice for supporting these practices. You can read more about their amazing buissnesses practices here. Red Robyn is a long way from home for me...metaphorically speaking. This is not a restaurant I would normally seek out or choose to dine at but I’ve got to give them some well deserved credit. After being in lectures all day at the Ancestral Health Symposium (AHS), I went to meet Corey and my parents at Waterfront Park. We had tickets for a ferry ride that was leaving very soon but I was starving!! I needed something in my belly. We walked around for a little while trying to finding something quick that wouldn’t kill me but had little luck. We headed back towards the ferry where their happened to be a Red Robyn next door and I decided to pop in to look at their menu. A super nice bartender helped me place a to-go order, cheeseburger on a gluten free bun, no french fries substitute steamed broccoli. The quality was not something I would choose everyday but it fueled me efficiently, didn’t upset my stomach and could be made quickly. There’s a time and a place for choices like this, don’t let perfection be the enemy of success! This stop came after a long day of being at AHS, exploring the city and visiting the Chihuly Gardens. It was en route back to our AirBNB and had enough options for me to be able to find something to eat, even if it wasn’t anything super special. I ended up ordering a kale Caesar salad without croutons, add chicken AND bacon. Holy crap, I never knew a Caesar salad could be so damn good and I'm now convinced that Caesar salads should always come with bacon. I also loved that they did a mix of romaine and kale since raw kale can sometimes be rough on digestion and it’s nice to have those contrasting textures. I honestly can’t remember for the life of me what Corey and my parents had (I was so tired) but I’m certain they were all very satisfied and I noticed that their menu did have plenty of other gluten-free offerings! Both times we went I had the Dungeness Crab Melt (because it was just that good) on a gluten-free Brazilian cheese bun which came with a choice of side. Both times I chose the vegetable of the day which as sautéed zucchini and summer squash for the first time and sautéed greens for the second time. Corey had a wild smoked salmon pasta dish and I think both my mom and dad had their lamb burger, which I think my mom got on our second visit also! On our first visit we all shared a Blackberry Panna Cotta for dessert and I took a coconut fruit tart to-go which made for the perfect summit snack the next day after our first big hike up Mount Storm King. On our second visit, I had to make sure the coconut tarts were still delicious so we got another one and my dad order some lemon bars to-go (his ABSOLUTE favorite dessert, I was told I’d be killed if I touched them, which, naturally I did...hey look, I’m still alive!😆) I just loved everything about Nourish Sequim. They’re beautiful location and gardens, the cute outdoor patio, their passion for food quality and all of the staff were so kind and welcoming. Please go visit them and support local if you’re visiting the Sequim/Port Angeles area of Washington! I promise you won’t be disappointed. I’ve heard this from a couple different reviewers online...Port Angeles does not have the greatest dining options. Next Door Gastro Pub, located right downtown, was one of the few restaurants that got really great reviews. We didn’t make it a point to eat out a ton while staying in Port Angeles as we had rented a house for the week and were buying and cooking most of our own food. However our visit to Next Door Gastro Pub came after an all day road trip to the pacific coast where we hiked an explored Neah Bay and Shi Shi Beach. It was definitely more walking/hiking miles than my parents anticipated logging (always anticipated more miles when hiking with me) and we pretty much failed at packing enough food for the day trip. We got back into Port Angeles right around dinner time and went straight to Next Door, tired, muddy and famished. They had an epic selection of unique burgers and sandwiches to choose from, exactly what we all wanted after such an awesome but exhausting day! To start, Corey and my dad shared some jalapeño cheddar hush puppies and I ordered the “Mrs.Newton” burger which came with thick cut bacon, brie, fig jam, arugula and a stout mustard which I substituted for the basil aioli. I also added avocado for extra fat, substituted a gluten-free bun and had a side of sweet potato fries. I was again so tired and hungry that I honestly can’t remember what everyone else had! No one left unhappy though, I know that. Next Door Gastro Pub is a great choice if you’re looking for a fun dining experience in Port Angeles. I might as well touch on the grocery stores we frequented during our stays in both Seattle and Port Angeles since these were also a large part of our food experience while traveling. PCC and Whole Foods in Seattle were both great for picking up the necessities, without sacrificing quality, to stock our rental kitchens. Port Angeles had an adorable little health food store called Country Aire that we did all of our shopping at while we were staying there. It’s also worth noting that their are TWO local farmers markets you may want to check out for other local food and products! One is in downtown Port Angeles and the other is in Sequim. We went to both on our last day in town and I was able to get a delicious local hot tea, a satchel of local lavender, local lavender beeswax candle and lavender chapstick (I did say they were famous for their lavender farms). Side note: Food quality is very important to me as it helps me obtain as many nutrients as possible and keep my colitis in remission, which is especially important while I’m traveling as I don’t want to risk having a reaction and triggering a flare. However, if you’re on a budget while traveling and your health can afford to sacrifice food quality for a little while, you may find places like Safeway, Costco, etc. to be a better choice while vacationing. I know how quickly the bills at Whole Foods can add up. Below are some of the photos I managed to take during our dining experiences! Please comment below if you found this synopsis helpful or have dined at any of these restaurants before.